You've probably seen that picture million times. A giant concrete white statue of Christ the Redeemer with its hands spread, overlooking the mountainous landscape and beaches of Brazilian most exciting city, Rio de Janeiro. The sight is impressive on photos, but the reality is even better. The statue has been guarding Rio de Janeiro already for more than 90 years (although the idea to place it there was even older) and nowadays, probably no one can imagine Rio's cityscape without the statue towering on Corcovado Mountain. Tourists of all religions are driven to visit the most sought-after and iconic attraction of Rio, Christ the Redeemer, closely followed by another exceptional landmark, Sugarloaf Mountain. But unlike Sugarloaf Mountain, the statue of Jesus made it on the list of New7Wonders of the World in 2007, and since then its star shines brightly. During our South American trip, we had already visited another new world's wonder, Machu Picchu in Peru, and although both landmarks are very different, they have one in common. An aura of uniqueness which will leave you standing in front of it in awe. - the idea of constructing the statue overlooking on Corcovado Mountain emerged in 1920, after World War I when representatives of the Brazilian republic felt that the country needs a symbol to strengthen their faith again. - the construction of Christ the Redeemer was finished in 1931. - there's a built-in chapel at the statue's base from 2006. - the statue is 30 meters high standing on 8 meters high pedestal and weights 635 tons. - arms of Christ the Redeemer stretch 28 meters wide. - the statue stands 700 meters above sea level and is located in Tijuca Forest National Park. The easiest and most efficient way to get there is by Uber, and that's what we did. We have only good experience with this service in Brazil and used it every time we needed to cover longer distances within the city. Uber has a great feature called 'juntos' where you can share a ride with other passengers and save some money (actually it's almost a half of the regular price), the ride itself takes a little bit longer though, as the driver will pick up more people along the way. Unfortunately, this great option is available only in Rio and Sao Paulo. When using public transport, it depends on where are you staying, but you must get to a small bus terminal Cosme Velho (you can jump off one stop before at São Judas Tadeu which is right across Trem do Corcovado station), the closest stop to the foothill of Corcovado Mountain. If you don't have a direct bus nearby your hotel, the closest metro station is Largo do Machado (still 40 minutes walk from the base), so from here you can take a bus number 580 going to Cosme Velho. One ride cost between R 3 - 4. You can be also picked up by one of two official vans cruising around the city every day. The official pick up point is at Praca do Lido in Copacabana, next to the metro at Lago do Machado and at Città America in Barra da Tijuca. From both places, vans leave approximately every 15 minutes, and the price already includes the return transport and the entry fee. The price differs according to the season - in high season, it is R 102 from Barra de Tijuca and R 70 from Praça do Largo do Machado. 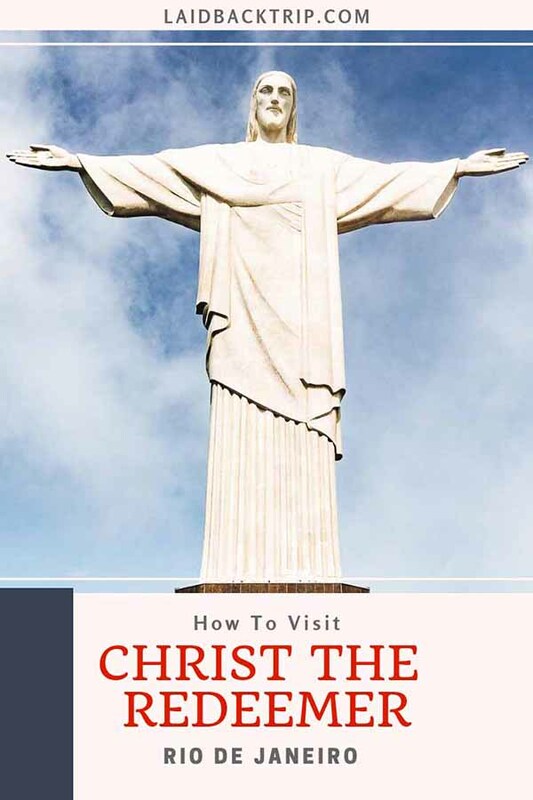 HOW TO VISIT CHRIST THE REDEEMER? There are three ways how to get to Christ the Redeemer. You can take a train, van or hike. Cog Train | The most famous and traditional way how to reach Christ the Redeemer is by cog train. The train will take you through Atlantic Forest almost to the top of Corcovado Mountain. The train leaves approximately every 30 minutes, and the ride up takes 20 minutes. Because the cog train option is the most popular one, expect queues, especially in high season between December and March. To avoid queues, buy your ticket online in advance for the exact time, so you won't have to wait long. When we visited Christ the Redeemer, the next train people could catch when they did not purchase tickets in advance was in three hours. The return ticket cost R 79. Van | Another option how to get to Christ the Redeemer is by taking a van. This option is slightly cheaper than going to Corcovado Mountain by cog train but is not that comfortable and in our opinion lacks the sense of adventure. You can either take a direct van from Copacana or Barra da Tijuca as we mentioned above, or you can arrive at Trem do Corcovado by public transport and from here take a taxi. The only problem is that to the top of Corcovado Mountain can drive only official vans, so in that case, you would have to take a non-official van from Cosme Velho to the visitors center for R 30 (located in the middle of the hill) and here switch to the official van for R 40. As you can see, this option is quite expensive as it doesn't include the entrance fee yet. Hike | Although under normal circumstances we would have loved to walk all the way up to Christ the Redeemer via Tijuca Forest National Park, we decided against it. The reason is very unfortunate - criminals operate along the trail, and a large number of muggings incidents have been reported lately (58 muggings within two weeks in July 2017). It is a shame, but unless the situation changes drastically and police will start working on this problem, we don't recommend you to hike on the top of Corcovado Mountain. If you decide to go for it anyway, do not take your valuables or at least, do not hike alone but in a larger group. It is better to take some cash to have something to hand over. We think it might be hard to explain that you do not carry anything because of a language barrier. The hike starts at Parque Lage next to the botanical garden and will take you approximately one hour and a half one way. The walk is free, but you still have to pay a fee to get to Christ the Redeemer, R 31 in high season. Generally, choosing the right time can significantly influence your experience, but unfortunately, it is hard to predict how many people plan to visit Christ the Redeemer on the day you selected. Usually, it is better to visit the statue on weekdays rather than on the weekend when many local people pay a visit to this iconic landmark. Be prepared that Christ the Redeemer is one of the most visited places in Brazil, altogether with Iguazu Falls, so do not expect to have it for yourself. Rather prepare yourself mentally for the second option that you will be missing your personal space for a while. To avoid crowds, it is recommended to visit Corcovado Mountain early in the morning, let's say around 8:30 AM or later in the afternoon, after 3:30 PM. Weather in Rio de Janeiro is often sunny, but because the statue of Christ the Redeemer stands on top of the Corcovado Mountain in Atlantic Forest, it can be often foggy or cloudy up there, which can greatly affect your experience. To increase your chances to enjoy nice weather, we recommend you to book your train tickets last minute if you can (always check online how many tickets are left to avoid disappointment). IS IT WORTH TO VISIT ON A TOUR? There are many tours available offering a visit of Christ the Redeemer, some of them even combine this attraction with Sugarloaf Mountain. It is not hard, nor dangerous to visit Christ the Redeemer on your own, but if you feel that taking a tour would be less stressful and less time-consuming for you, you can find some options here. Rio de Janeiro has a pretty bad reputation when it comes to safety, and you should always follow basic rules. Luckily, we created an article from our personal experience How To Stay Safe In South America which you might find useful. Overall, visiting Christ the Redeemer is quite safe activity when you do not plan on hiking the Corcovado Mountain. There is no shortage of accommodation in Rio, but it can be booked out long in advance during busy periods such as Carnival or Eastern. When looking for a hotel, always check the reputation of the area first. There are two major areas where visitors usually stay - near the city center or close to two famous beaches. Budget | Hotel Belas Artes - It will probably be hard to find a room with breakfast close to the city center for a similarly cheap price, so when available, go for it. Mid-range | Ibis Rio de Janeiro Santos Dumont - A classic modern chain hotel where you know what to expect. It is in a safe area, and the service is excellent. Luxury | Miramar Hotel by Windsor - Amazing hotel located right across Copacabana Beach is a top choice for everyone looking for a high standard and perfect settings.